The Cal Olson designed CasaBlanca Golf Club lies etched into the wetlands of the Mesquite Valley. This beautiful course winds in and out of the Virgin River basin offering a new experience on every tee. 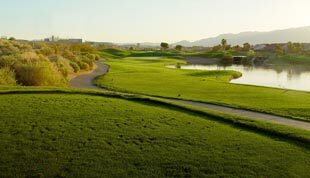 Five sets of tees allow golfers of all skill levels a fair chance on this championship golf course, which annually hosts the Nevada Open and Mesquite Amateur. 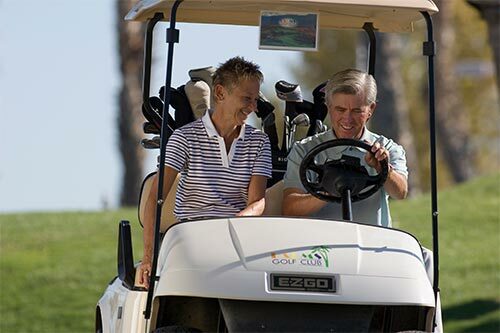 $99 Stay and Play or Build Your Own Golf Vacation packages are available with the CasaBlanca Resort. 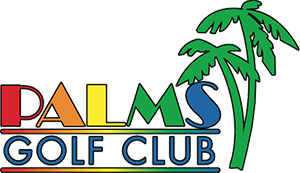 A challenge for all levels of players, the Palms championship course in Mesquite features lakes, sand traps and more than 200 palm trees, the 6.804 yard, par 72 is a challenge for golfers of all levels. The front nine offers extended fairways and plenty of water features, while the mountainous back nine has dramatic elevation changes and emphasizes shot placement. The 15th hole has a breathtaking view and vertical drop of 114 feet from the tee to the fairway. One of the newest additions to the Mesquite golf scene, Falcon Ridge winds through the hills and canyons of Northwest Mesquite. This 6,569 yard par 72 desert layout boasts some beautiful landscapes. Spectacular elevation changes, numerous water features and high mesa views along with a track that is playable for all classes. Sand Hollow Resort’s Championship Course is the perfect balance of Links golf and Southwest desert landscape. Framed by the native landscape, the 7,315-yard, par-72 18-hole course takes full advantage of the region’s natural beauty. Experience Mesquite’s newest golf challenge. This 18-hole scenic masterpiece is artfully interwoven with the character and contours of Sun City Mesquite’s spectacular landforms. Undulating through canyons with gently ascending and descending elevations, rugged rock outcroppings and tranquil water elements, the integrity of the land is preserved at every opportunity. The masterful design and vision of famed golf course designer Gary Panks, creates the appearance of a course crafted by nature and forged over time. Conestoga is professionally managed by Troon Golf. The Palmer Course is Arnold Palmer’s magnificent masterpiece in the desert. Part of the 36 hole Oasis Golf Club, this par-71 course offers you a choice of five different tees and some of the most scenic desert panoramas in Southern Nevada. It’s rugged canyon fairways and meticulous contour greens set this course apart as one of the best 18 holes you can play. The Palmer Course has been rated among the “Top 10 You Can Play” by Golf Digest. 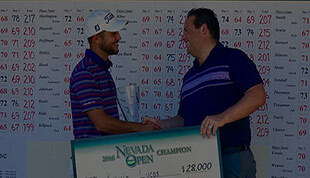 All but one episode of the Big Break Mesquite was hosted by the Oasis Golf Club. The Canyons Course is the perfect compliment to the Palmer Course. Rated more difficult than the Palmer course, the Canyons has two distinct front and back 9 layouts. The front 9 plays a lot like the Palmer course, however the back 9 demands length and precision to narrow targets. Every hole is distinct in its features utilizing every club in your bag. Like the Palmer Course, the back 9 of the Canyons was designed by Arnold Palmer. Sky Mountain Golf Course is a public 18-hole golf course owned and operated by the City of Hurricane. It is located in scenic Southern Utah, St. George area and part of the Red Rock Golf Trail. Sky Mountain is surrounded by Zion National Park and the Pine Valley Mountain Range. Sky Mountain Golf Course is set in one of the most picturesque and beautiful locations in the world. The 6,383 yard / par 72 course is much more challenging than the yardage would indicate. With its impressive red rock backdrops, immaculately designed greens, and expansive view of Snow Canyon State Park, The Ledges Golf Club offers world class golf unlike anything else in Southern Utah. This 7,145 yard 18-hole golf course was designed by Matt Dye. Each hole has been carefully created to provide a unique golf environment unmatched anywhere else in the world. You’ll admire the natural beauty and breathtaking views of the surrounding sandstone mountains while enjoying a round of golf on our spectacular course.